Once you’ve earned your real estate license, there are many skills that will help you launch a successful career. Communication is one of the most important skills for new real estate agents to master. Communication leads everything that you do as a real estate agent, whether you’re explaining the buying process to a first-time home buyer, negotiating an offer for a seller, or marketing to prospects via social media, your website, or your blog. 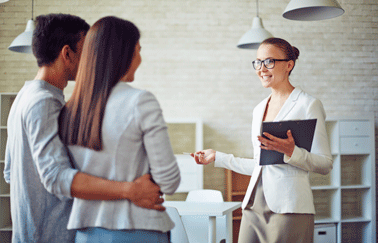 Here are six ways new real estate agents can learn to master great communication skills. Picture this: You’re in the middle of negotiating the sale of a home, and you’re representing the sellers. You tell the buyer’s agent that your clients are open to discussing the offer, but your arms are crossed and you haven’t made eye contact yet. You might be saying that you two can move this deal to the closing table, but your body language is saying otherwise. Remember, you’re constantly communicating, even when you’re not talking. When you share stories and experiences with your clients, you’re engaging them and building trust. You’re letting them know you’ve “been there, done that” and have the experience and knowledge to guide them through that same experience. You’re also engaging them and bringing them into the conversation. Being a good listener is key to communication. Ask questions, and paraphrase what the other person has just said. This shows you’re interested in what they have to say and are paying attention. It also helps clarify any points that you may have misunderstood. Listening, repeating, and questioning the other person can help keep everyone on the same page. Put away the cell phone, stop answering emails, and focus on the conversation that you’re having. In today’s technology-focused society, this is a common pitfall that new real estate agents should avoid. It can be hard to step away from your devices, but effective communication in a face-to-face setting depends on it. Keep your emails short and sweet without leaving anything out. Be as concise and specific as possible. That goes for oral communication, too. Good eye contact is another important skill new real estate agents should learn. It can feel a bit strange to look people directly in the eye. But Dale Carnegie, author of How to Win Friends and Influence People, cites several studies that show making eye contact conveys truth and honor. In some cases, over-use of eye contact can unsettle the other person. Do make direct eye contact now and then, but don’t take it too far. You may prefer to use email to communicate with clients, but your client may prefer a phone call instead. At the start of your client-agent relationship, ask the client their preferred mode of communication: phone, texts, emails, or in-person meetings. The more practice new real estate agents get working with buyers, sellers, real estate affiliates, and others, the easier it becomes to communicate effectively. Good communication takes practice, but it’s well worth the effort. Improving your communication skills will not only improve your real estate career, but also your life. When you’re first starting out in real estate, it’s extremely important to learn how to communicate effectively. Beyond that, there are many other skills, traits, and resources that can help you launch a successful real estate career. Browse our previous blog posts to learn more about the traits of a successful real estate agent, how to develop a real estate business plan, how to choose a broker, and more tips for new real estate agents. Ready to make the leap and begin an exciting career in real estate? Sign up for real estate license education courses here.